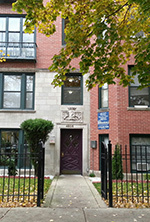 4606 N. Hermitage is a classic, vintage walk up building located in the highly desirable Ravenswood neighborhood. The property is located near the intersection of Damen and Montrose, on a quiet picturesque, tree-lined street within walking distance of shops and public transportation. The apartments are rehabbed with vintage charm. Parking is readily available on street, and with all utilities included, all residents pay with the rent is their internet and cable. 4606 makes living simple and affordable in a great neighborhood!